Jon grew up in a musical family: his grandfather playing guitar, his father playing harmonica, and his brothers playing tuba, trumpet, trombone, and guitar. He learned guitar and trumpet from his brothers and grandfather. 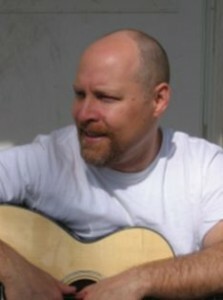 After discovering old time music and dance in 1995, he became hooked on contra dancing and playing the fiddle. Old time music and dance opened up a new world of flat footing and clogging as well. He joined the Apple Chill Cloggers in the spring of 2006. During the day, Jon works as a veterinarian. When he isn’t clogging or playing the fiddle, he enjoys making pottery and reading.